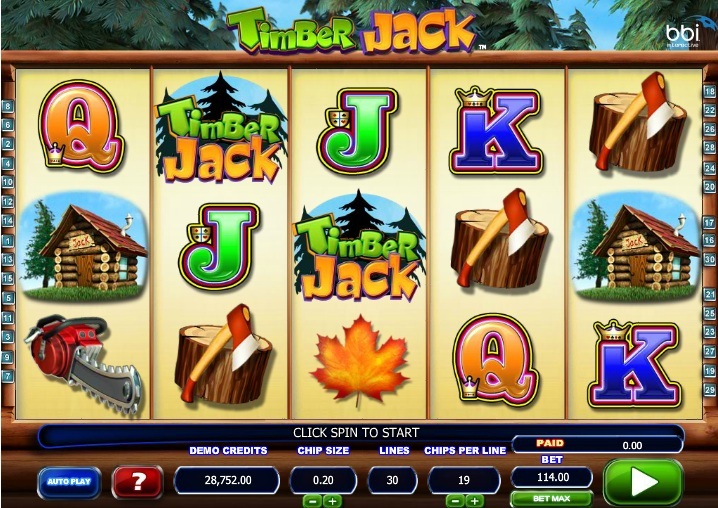 Timber Jack is a 5 reel, 30 pay-line slot from Blueberi Gaming released on the Quickfire platform developed by online slot developer Microgaming that has a strong lumber jack theme that has drawn inspiration from the male characters in the hit musical Seven Brides For Seven Brothers. This slot will take you to the North American frontier where they film Berocca adverts and attract tourists who want to see where television series such as the Waltons and Little House on the Prairie were filmed. The symbols on the reels consist of a lumberjack, a lumberjack's house, a lumberjack's axe that is stuck in a tree stump, a lumberjack's chainsaw, a tree leaf, and your regular Jack-through-to-Ace symbols. Everybody Loves a Wild Beaver! The Wild symbol is represented by the beaver icon. That is right, try not to laugh, but this slot does possess a Wild beaver. Interestingly, the Wild symbol substitutes for all symbols to complete winning combinations but if you use the Wild symbol to complete a winning combination of Timber Jack logo Scatters then your pay out will be lower than if you triggered a winning combination of Timber Jack logo Scatters without the Wild symbol's help. It is possible to earn up to 30,000 coins if you hit five Timber Jack logo Scatters across the reels. 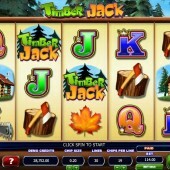 You will only earn 500 coins if you hit five Timber Jack logo symbols with one of the symbols represented by the Wild. There are free spins to be won on this slot as well. There are five Free Spins symbols on reels 2, 3 and 4. If you manage to hit three of these Free Spins symbols then you will trigger 5 free spins. If you hit four Free Spins symbols across the reels then you will earn 10 free spins. If you are fortunate enough to hit five Free Spins symbols across the five reels then you will be rewarded with 15 free spins. The Wild beavers are not done there either. They can appear as Stacked Wilds on reels 2, 3 and 4 during the free spins bonus round. If you manage to get three reels of Wilds then there is the potential to earn an 8x multiplier to your winnings which can see you earn some really decent payouts. Definitely worth keeping an eye out for those Wild beavers. After all, who doesn't love a Wild beaver? Timber Jack is a solid enough title. If you want a slot that focuses on beavers as much as this then you might want to check out the Dam Rich slot by Cryptologic. You will struggle to find a beaver or lumberjack-themed slot other than that and certainly not one that offers as much as this slot. This one has flown slightly under the radar but do not underestimate its appeal.